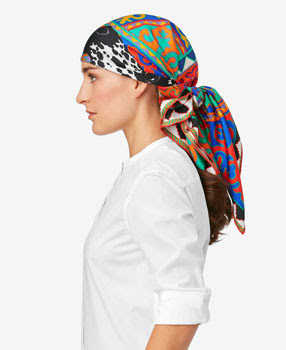 Luxury goods group Hermes recently introduced its new collection of silk scarves and shawls. A collection item called Appaloosa des Steppes has Kyrgyz national patterns together with an image of an Appaloosa horse. This was actively covered by Kyrgyz media, but an exciting story, which this item, intentionally or not, symbolizes, was left almost unnoticed. The story has rewritten the history of the Appaloosa horse. Still it is unknown whether the luxury goods maker was aware of and inspired by it — Hermes did not respond to a request to comment. The story begins back in 2012, when Scott Engstrom, then a 68-year-old lady, who breeds Appaloosa horses in New Zealand, saw Conor Woodman, a director and a television presenter, in his Around the World in 80 Trades. In that show Conor traded different things in foreign lands — from coffee in Africa and chili sauce in India to surfboards in China and horses in Kyrgyz Republic. Scott saw Conor selling a horse to a farmer and it looked like one of her Appaloosas. "And then I stood up in my lounge and screamed my head off..." recalled Scott. As Conor said, after Around The World in 80 Trades, in which he bartered his way round the world, a lot of people got in touch with all sorts of crazy business ideas they wanted him to help them with. So, as he remembers, he discounted Scott’s email as the ramblings of a crazy old lady and got on with his life. But Scott didn't stop and was bombarding Conor with emails — for years she had a theory that the Appaloosa actually came from Asia. She had to find Martin, the horse Conor sold. DNA evidence would prove her theory. As believed by most breeders, Appaloosas arrived in Mexico with the Spanish conquistadors. Scott believed they moved into America across the Bering Strait between Russia and Alaska, long before the Spanish Conquistadors brought them to the continent. This is how the film Secret Horse: Quest for the True Appaloosa was made. In 2012, Scott and Conor flew to Kyrgyz Republic to search for the evidence. The film tells Scott’s story — how her passion about the Appaloosa ended up changing the history of the North American horse. The journey was not easy — Martin , the horse, had been sold multiple times and the trail led to a dead end. After attending a game of kok boru or a goat polo, they learned about a place where there were horses that sounded like Appaloosas. Scott and Conor spent three days until they reached a remote valley, which finally rewarded them with a herd of Appaloosas. In Kyrgyz Republic the horses are known as chaar, which translates as 'spotted'. The owners of the horses let them be DNA tested. Scott's preterm confidence was finally confirmed when DNA results from Texas University were received. 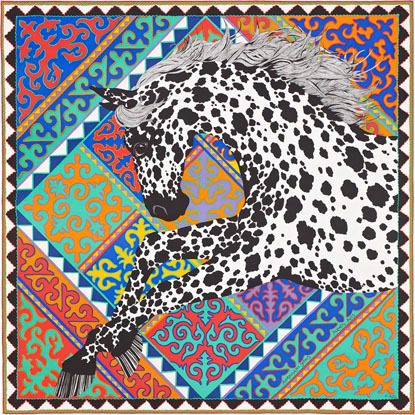 The Hermes scarf reminds us about this truly unique combination — a combination of Appaloosa horses and their origins. This article, originally titled Why This Hermes Scarf Is Way More Than Just a Scarf, appeared in GO KYG - Your Unofficial Guide to Kyrgyz Republic, an excellent resource about Kyrgyzstan. It is republished with permission.